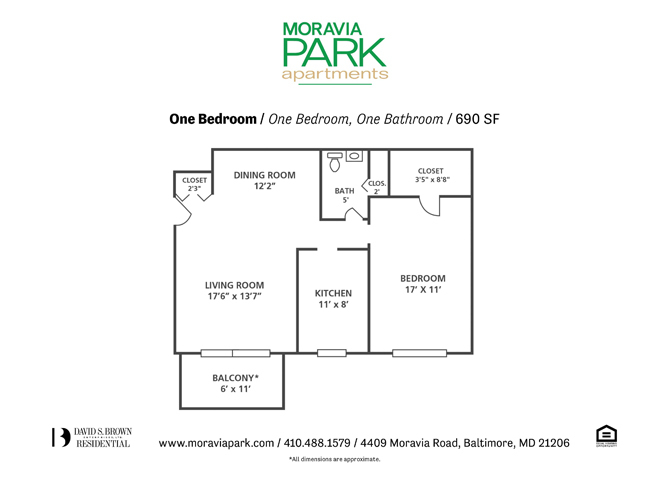 Moravia Park offers residents 1-bedroom and 2-bedroom apartments located in Baltimore. Easily accessible to downtown Baltimore, Moravia Park allows residents instant access to the many opportunities for education, culture, and entertainment in the city. Each apartment at Moravia Park conveniently features a full kitchen, individually controlled heat and air, walk-in closets, and private balconies in select apartments. Moravia Park has more to offer than any comparable apartment community in the area. A beautifully landscaped community in a comfortable setting, Moravia Park is designed for recreation, enjoyment and relaxation. Located in Baltimore, Maryland, Moravia Park is only minutes from downtown, major highways, hospitals, and universities. With retail, restaurant, and entertainment locations right around the corner, life is nothing but convenient for the residents of Moravia Park. Is your company a David S. Brown preferred employer? If so, you may qualify for added move-in benefits. Major employers include Baltimore City, Towson University, Johns Hopkins Hospital and many more. Get familiar with David S. Brown’s Preferred Employer Program by clicking the link below. I have been living at Moravia Park for 3 years now. It is a quiet and clean community. Easy access to the buildings for seniors. The staff is courteous and very helpful. The maintenance staff is very quick about getting any issue dealt with. Great maintenance, clean environment, and very prompt on fixing & improving. Love the staff, their very kind and polite. Moravia Park is a great community to reside in! I can honestly say they have the best customer service. Chris was very helpful during my move-in process and I have no had any issues up to this point. There is a lot to do in the area and everyone in the community is friendly!